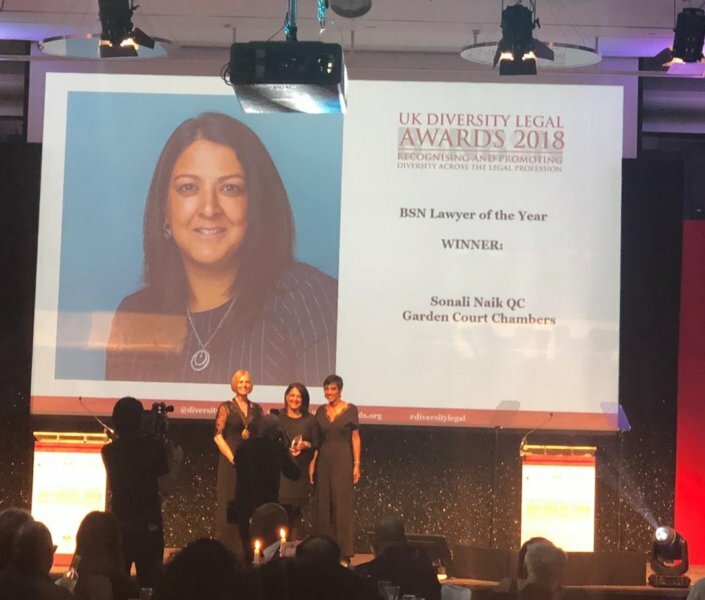 We are delighted to announce that Garden Court's Sonali Naik QC has been named BSN Lawyer of the Year at the UK Diversity Legal Awards 2018. She became a QC in 2018 and is the newly appointed Chair of Liberty. The Legal Diversity Awards are the only industry awards which focus solely on recognising, promoting and celebrating equality, diversity and inclusion across the legal profession. “there must be many refugees up and down the country who literally owe their lives to Sonali. Her legal representation at appeals and judicial reviews sometimes meant the difference between deportation and freedom. She has turned around cases that others in her profession considered hopeless." Within these areas she has built a diverse practice covering human rights, lawfulness of detention, national security and naturalisation. A large amount of Sonali's work concerns strategic litigation, often challenging Home Office policy requiring considerable skill in evidential analysis, creative and innovative thinking and written and oral persuasion. Many of Sonali's cases concern very vulnerable clients and involve highly complex, sensitive and difficult issues, often requiring urgent action due to the circumstances of the case. She acted for an Afghan child in bringing a widely reported judicial review after he was denied entry to the UK when the “jungle camp” at Calais where he was living was demolished. The challenge argues that the Home Office failed to comply with its duties under the ‘Dubs amendment’. Judgment is awaited. In May, the Home Secretary – in direct response to judicial review proceedings in which Sonali acted– published amendments to his deportations policy, affecting thousands of migrants and asylum-seekers. As a result, the policy now admits express flexibility to cater for individual cases, and addresses the right of access to legal representation and the courts to challenge removal. Sonali formerly worked in the NGO sector. She currently chairs Liberty, and is a trustee of Freedom from Torture, an Advisory Council member of JUSTICE, a trustee of the Immigrants’ Aid Trust (part of the Joint Council for the Welfare of Immigrants) and a Patron of the Clean Break theatre company working with women ex-offenders. She became a QC in 2018. She is currently one of only 22 practicing BAME women silks (1). Sonali Naik QC is a member of the Garden Court Chambers Administrative and Public Law Team, Immigration Team and Civil Liberties and Human Rights Team. See also Guardian article putting a spotlight on female QCs changing the face of law (January 2018).